The glycemic index (GI) is a measure of how much an individual food elevates blood sugar when it's eaten. To measure it, investigators feed a person a food that contains a fixed amount of carbohydrate, and measure their blood glucose response over time. Then they determine the area under the glucose curve and compare it to a standard food such as white bread or pure glucose. Each food must contain the same total amount of carbohydrate, so you might have to eat a big plate of carrots to compare with a slice of bread. You end up with a number that reflects the food's ability to elevate glucose when eaten in isolation. It depends in large part on how quickly the carbohydrate is digested/absorbed, with higher numbers usually resulting from faster absorption. The GI is a standby of modern nutritional advice. It's easy to believe in because processed foods tend to have a higher glycemic index than minimally processed foods, high blood sugar is bad, and chronically high insulin is bad. Yet many people have criticized the concept. Why? Blood sugar responses to a carbohydrate-containing foods vary greatly from person to person. For example, I can eat a medium potato and a big slice of white bread (roughly 60 g carbohydrate) with nothing else and only see a modest spike in my blood sugar. I barely break 100 mg/dL and I'm back at fasting glucose levels within an hour and a half. You can see a graph of this experiment here. That's what happens when you have a well-functioning pancreas and insulin-sensitive tissues. Your body shunts glucose into the tissues almost as rapidly as it enters the bloodstream. Someone with impaired glucose tolerance might have gone up to 170 mg/dL for two and a half hours on the same meal. The other factor is that foods aren't eaten in isolation. Fat, protein, acidity and other factors slow carbohydrate absorption in the context of a normal meal, to the point where the GI of the individual foods become much less pronounced. Researchers have conducted a number of controlled trials comparing low-GI diets to high-GI diets. I've done an informal literature review to see what the overall findings are. I'm only interested in long-term studies-- 10 weeks or longer-- and I've excluded studies using subjects with metabolic disorders such as diabetes. The question I'm asking with this review is, what are the health effects of a low-glycemic index diet on a healthy normal-weight or overweight person? I found a total of seven studies on PubMed in which investigators varied GI while keeping total carbohydrate about the same, for 10 weeks or longer. I'll present them out of chronological order because they flow better that way. One issue with this literature that I want to highlight before we proceed is that most of these studies weren't properly controlled to isolate the effects of GI independent of other factors. Low GI foods are often whole foods with more fiber, more nutrients, and a higher satiety value per calorie than high GI foods. Study #1. Investigators put overweight women on a 12-week diet of either high-GI or low-GI foods with an equal amount of total carbohydrate. Both were unrestricted in calories. Body composition and total food intake were the same on both diets. Despite the diet advice aimed at changing GI, the investigators found that both groups' glucose and insulin curves were the same! Study #2. Investigators divided 129 overweight young adults into four different diet groups for 12 weeks. Diet #1: high GI, high carbohydrate (60%). Diet #2: low GI, high carbohydrate. Diet #3: high GI, high-protein (28%). Diet #4: low GI, high protein. The high-protein diets were also a bit higher in fat. Although the differences were small and mostly not statistically significant, participants on diet #3 improved the most overall in my opinion. They lost the most weight, and had the greatest decrease in fasting insulin and calculated insulin resistance. Diet #2 came out modestly ahead of diet #1 on fat loss and fasting insulin. Study #3. At 18 months, this is by far the longest trial. Investigators assigned 203 healthy Brazilian women to either a low-GI or high-GI energy-restricted diet. The difference in GI between the two diets was substantial; the high-GI diet was supposed to be double the low-GI diet. This was accomplished by a number of differences between diets, including different types of rice and higher bean consumption in the low-GI group. Weight loss was a meager 1/3 pound greater in the low-GI group, a difference that was not statistically significant at 18 months. Changes in estimated insulin sensitivity were not statistically significant. Study #4. The FUNGENUT study. In this 12-week intervention, investigators divided 47 subjects with the metabolic syndrome into two diet groups. One was a high-glycemic, high-wheat group; the other was a low-glycemic, high-rye group. After 12 weeks, there was an improvement in the insulinogenic index (a marker of early insulin secretion in response to carbohydrate) in the rye group but not the wheat group. 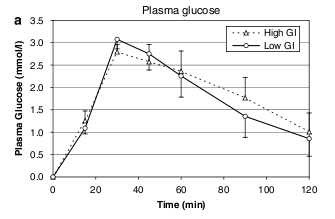 Glucose tolerance was essentially the same in both groups. What makes this study unique is they went on to look at changes in gene expression in subcutaneous fat tissue before and after the diets. They found a decrease in the expression of stress and inflammation-related genes in the rye group, and an increase in stress and inflammation genes in the wheat group. They interpreted this as being the result of the different GIs of the two diets. Further research will have to determine whether the result they observed is due to the glycemic differences of the two diets or something else. Study #5. Investigators divided 18 subjects with elevated cardiovascular disease risk markers into two diets differing in their GI, for 12 weeks. The low-glycemic group lost 4 kg (statistically significant), while the high-glycemic group lost 1.5 kg (not statistically significant). In addition, the low-GI group ended up with lower 24-hour blood glucose measurements. This study was a bit strange because of the fact that the high-GI group started off 14 kg heavier than the low-GI group, and the way the data are reported is difficult to understand. Perhaps these limitations, along with the study's incongruence with other controlled trails, are what inspired the authors to describe it as a pilot study. Study #6. 45 overweight females were divided between high-GI and low-GI diets for 10 weeks. The low-GI group lost a small amount more fat than the high-GI group, but the difference wasn't significant. The low-GI group also had a 10% drop in LDL cholesterol. Study #7. This was the second-longest trial, at 4 months. 34 subjects with impaired glucose tolerance were divided into three diet groups. Diet #1: high-carbohydrate (60%), high-GI. Diet #2: high-carbohydrate, low-GI. Diet #3: "low-carbohydrate" (49%), "high-fat" (monounsaturated from olive and canola oil). The diet #1 group lost the most weight, followed by diet #2, while diet #3 gained weight. The differences were small but statistically significant. The insulin and triglyceride response to a test meal improved in diet group #1 but not #2. The insulin response also improved in group #3. The high-GI group came out looking pretty good. Great post, Stephan. Last year a woman gave a seminar here at UConn on her research with glycemic indexes. Her conclusion was basically that the interindividual variation was so great for any given food that the published averages were completely useless and totally meaningless. The most interesting result was for white flour. All of the comparisons were to pure glucose as the index carbohydrate, so naturally all of them had lower GI than pure glucose. But some of the subjects exhibited a massively higher blood sugar response to white flour than to pure glucose! How is this possible? The only thing I can think of is this: blood sugar is not just controlled by glucose input from the intestines, but also glucose input from the liver due to glcyogen breakdown and gluconeogenesis. Stress hormones turn on these processes and increase blood sugar. Thus, some people, probably gluten intolerant people, react to wheat with stress hormones. I find it weird that the rye/wheat authors did not suggest that the increased GI of wheat compared to rye is a secondary to the increased stress response as a competing hypothesis for the inverse, that the stress response is secondary to the increased GI. all problems with health began when the public was taught to demonize saturated fat. Now we have this fish oil craze that is another misleading propaghanda that will lead people to another dead end in there search. Every culture must have been onto something.... they all included starch with saturated fat. North american indians and tubers, southwester and mexico had corn, french has pasta, egypt and quinoa. Starches isn't the problem, hydro-PUFA's and too much refined sugar is the problem. Gotta suspect a study where a high carb, high glycemic diet has the best results for diabetics, and a carb reduced diet has the worst. That doesn't sit right. The problem with describing wheat as a specific problem is that wheat, right next to potatoes, is our primary source of starch. Is it the wheat, or is it the fact that krispy creams are made of it? Potatoes are far less unhealthy, really the only option for junk potato food is chips and maybe some cultural food like kinish or sheppards pie... but even these supposedly "unhealthY" foods are ten thousands times more healthy than wheat crackers or wheat donuts or wheat cookies and cakes. It's hard to say that wheat is this specific problem, when it just so happens that the worst foods for people with a vulnerability to metabolic disease happen to be made from wheat (and, these foods are "worst" not because they are wheat, but because they are very high calorie and high in carb with very little protein). Awesome. Can't wait for the follow up post. I read with interest a post over at Robb Wolf's blog about a study highlighted by Cordain which linked amount and type of fat with changes in insulin sensitivity. Since they're looking at blood levels, I think they're excluding the digestive effects. "It has been shown in rats that under certain circumstances, free fatty acids are required for glucose-stimulated insulin resistance. Essentially, when rats are infused with a high level of glucose, in the absence of fatty acids, the insulin response is non-existent. In contrast, when this occurs in the presence of high levels of free fatty acids, glucose-stimulated insulin resistance is extremely elevated. It was shown in these studies on rats that the amount of saturation of the fatty acid was also correlated with insulin secretion. The more saturated the fat, the higher the insulin burst. Thus, in rats, it seems that free fatty acids are vital to produce glucose-stimulated insulin resistance, and, of these, saturated fats have the most detrimental effects. So at a minimum, this suggests that understanding measurements of glucose & insulin levels requires controlling for type and amount of fats. Additionally, it suggests -- maybe -- partitioning eating? Eat fat & protein in one sitting, then eat carbs at a different sitting? It also adds a piece to the puzzle of how sugar is so damaging, since the fructose half gets rapidly converted into circulating fatty acids, which, perhaps, themselves decrease insulin sensitivity, making the glucose half damaging. I'll take a 2nd look at study #5 later today. It's the gliadin peptide in gluten, as Chris eluded to, which causes an inflammation response in about a third of the population. There's lots of celiac disease research out there that shows supposed control subjects still reacting to wheat. It wouldn't be super surprising if saturated fat kept glucose levels high, since HGH for example can basically shut down glucose uptake into muscles. The body likes to run either on a fatty acid metabolism or a glucose/amino acid metabolism but not both. Saturated fat and glucose are both pure fuel for the body, unlike say fructose or monounsaturated fat, which both require processing to transform them into fuels. Ed, are you aware that insulin rises in response to protein intake as well? Was that controlled for in the study you cited? 1. I was losing anywhere from 2-4# per week on a higher glycemic diet (130-150g carbs/day from mixed high glycemic and low glycemic carb sources), lower fat (30-35% fat, mostly monounsaturated), low to minimum protein requirements 55-70g protein per day. Calorie intake was somewhere between 700 - 1100 kcal/day range. I was hungry ALL the time. I saw blood sugars higher than ever (the highest was in the 170s) and I had routine fasting bgs in the 130s. I could not sustain this diet. The blood sugars were rising. I was feeling worse and worse. Anxiety out the ying yang. Hungry all the time. Chronic pain levels routinely at a 9 or 10. Knots on my hand and wrist joints. But lost 60lbs in 3 months. So I stopped it and restarted my low carb diet. 2. Now I'm following a low carb, high fat (high saturated fat, low pufa, high mono), moderate to high protein diet, averaging <20g of non-netted carbs per day. No artificial sugars, sweeteners or drinks. Daily decaf, black coffee is the only daily beverage other than water. Red wine (2-3glasses per month) is an occasional thing. My fat ranges anywhere from 65-80%, protein ranges from 18-35%, and carbs are generally only around 3-5%. I have done this religiously. During this period I did a 20day experiment with zc which I did not tolerate well. I have only lost about 8lbs since December. During this time I've been averaging anywhere from 1400-2500kcals per day and higher that that even when I was zc. (I've been lc longer than from the first of the year though). In the late summer of last year, after stopping the other diet and going low carb, I was eating between 30-50g of carbs per day of veggie based carbs (low gi) and was gaining about 4lbs a month again. I ate between 1400-1800kcals/day. My blood sugars however have gone from fasting 130s to post-prandial 170s down to fasting high 90s-low 100s to post-prandial 120s at the highest. So what am I supposed to do to lose weight? The weight loss on lc is SOOOO slow, I get discouraged. Am I continuing to increase insulin resistance with the high fat, low carb, moderate to high protein diet? Any help would be appreciated! It's so hard to know which diet is right! Yeah table 1 doesn't match the results cited in the article by Philippou et al. at all. In the caption it has in parenthesis at the end, "( Median (IQR)." Note the lack of a second closing bracket. IQR probably means intra-quartile range, i.e. they are throwing out half the total subjects, half on either side of the median. Given that the study only had seven low GI and six high GI subjects, that would mean the table is composed of data from three subject each. Calculating a standard deviation from only three observations is rather iffy. Even the numbers within the table are not consistent. For example, they give us baseline and week 12 values, but then the "difference from baseline" values aren't a simple subtraction. Basically, these guys don't seem to understand simple math. I love the line about the one subject that was excluded because he obtained 25 % of his calories from alcohol. 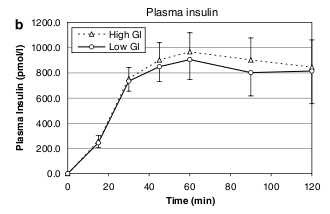 The conclusion, "Nevertheless only the low GI group had an improvement in blood glucose levels supporting Wolever's observation (Wolever, 2003) that the metabolic advantage of a slowly absorbed diet (low GI diet) is greater than its glycaemic impact." is a bad joke if you take a single look at Figure 1. An alternative explanation is that the white flour inhibited glucose clearance from the blood. Maybe by creating insulin resistance or affecting insulin release by the pancreas. The FUNGENUT authors note that the wheat diet induced reactive hypoglycemia: "We also found that ingestion of wheat bread is followed by initial hyperinsulinemia and a subsequent transient drop in glycemia below fasting levels, which was not seen after rye bread meals". They blame it on the high GI but I'm not convinced that's the explanation. They go on to state that "hypoglycemia results in activation of counterregulatory stress hormones such as cortisol, glucagons, catecholamines..." Although I suppose by that mechanism you would expect wheat to have a lowered GI. Whatever's going on, it's not good. My personal theory is that gluten affects the release of hormones from the small intestine in many people by activating a stress response. The small intestine secretes dozens of hormones, some of which (the incretins) influence insulin release by the pancreas. Others influence insulin sensitivity. 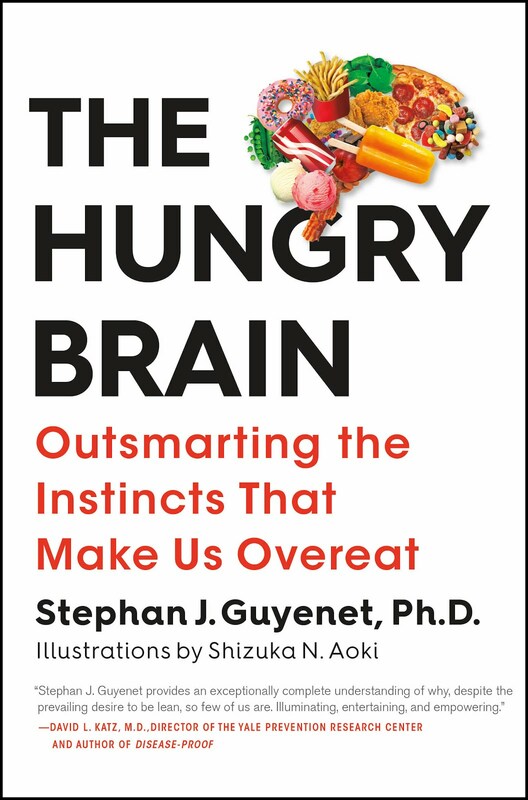 The small intestine also communicates with the hypothalamus and the liver through the vagus nerve, influencing satiety, insulin sensitivity and food intake behaviors. There was a paper that came out a while ago that showed that gut biopsies from 5/6 non-celiac controls reacted to gliadin by producing interleukin-15. The paper is not super convincing and needs to be repeated (along with neg control peptides) but it's intriguing. Yeah I don't know what was going on in that study. Plenty of cultures went downhill on wheat without eating it in donut form. I agree that it's hard to tease apart variables, but I feel wheat being problematic over the long term is a good fit for all the data I'm aware of. I suspect that if there's an effect at all, it's a small one, and it certainly doesn't account for the massive insulin resistance we see commonly in industrial nations. It sounds like your glucose control has improved considerably, so that's good. Have you considered going paleo for a while? OK, well I'm glad that paper confused you as much as it confused me. I thought I was going crazy. How did that make it through the peer review process?? By paleo do you mean adding non-wheat grains such as quinoa and tubers and things like that - along with fruit? As in upping the carb consumption? Who do you recommend following on the paleo style eating? I'm going to go check out Schwartzbein's book next week. Do you have a paleo book you recommend? It sounds to me like you have an excess of inflammation based on your chronic pain and aversion to exercise. This could be from any number of sources: self-induced stress over your weight, lack of sleep, medication (e.g. statins and myopathy), inadequate vitamin D, thyroid problems, autoimmune problems from grains/dairy/legumes in your diet, etc. One thing that I learned reading about acylation-stimulating protein (ASP) is that it is strongly regulated by the body's inflammation response such as cortisol. ASP is a low-level hormone that is responsible for determining whether your fat cells are gaining or losing fatty acids over time. Too much inflammation/stress and you won't lose body fat easily. It can be a vicious cycle. I don't necessarily mean increasing carbohydrate. You have diabetes so you should be very cautious with carbohydrate. It sounds from what you said that LC has been good to you. I just mean avoiding grains (especially gluten grains), dairy, sugar, vegetable oils and processed food for a while to see if it helps. Dr. Lindeberg's trial using a paleo diet to treat type II diabetics was very encouraging so I think it's a logical strategy. What Robert said about vitamin D makes sense too. You might as well normalize your vitamin D status with sunlight or D3 supplements to see if that helps. If you try a paleo diet, please let us know how it affects your glucose control and overall well-being. I looked up some pictures of them, they do look pretty good. But it turns out they eat a variety of grains, and from what I read, wheat is not their main grain crop. Millet and sorghum seem to be used more than wheat. Do you have any data on cavity rate or rates of non-communicable disease for them? It's difficult to make judgments about their health when all we have are a few photos, presumably of the more attractive individuals. Do you have a link for that trial please. A great blog as usual which must have again taken a lot of work. Following your comments on saturated fats and fish oil, I think it is a question of balance in all things. We do seem to have a habit of taking things to extremes. I agree that the demonisation of saturated fat is bad news. The problem is the kernels of truth like lard stripped of all nutrients and minerals, hydrogenated and partially oxidised, high in Omega 6 and low in Omega Three, is not good for you, has been translated into all saturated fats are bad. On the subject of fish oil there are misleading messages, and it is a complex subject. However there is no question that most people are deficient in DHA, and that intake levels in many are woefully low. Fish and fish oil are one of the few dietary sources of DHA. There is also no question that the consequences of DHA deficits, and huge imbalances in the plant-based omega-3s and 6s, have huge negative health consequences in a vast range of conditions. People who eat lots of millet and less wheat have a much higher risk of goiter than people who eat lots of wheat and less millet. Millet is very goitrogenic; wheat is not. Traditional fermentation of millet makes it MORE goitrogenic, whereas a long enough fermentation of wheat destroys the gluten and makes it apparently non-immunogenic. I think there is little question that properly prepared wheat is vastly healthier than millet, which cannot be properly prepared, except perhaps to eat it raw, which is its least goitrogenic form. if the normal joe didn't shun saturated animal fat they would get the trace amounts of DHA that come in all animal fat. The problem now is that you have all these people that think saturated fats are still evil, but the new thing is omega fish oils... taken by the spoonfools after they eat there low fat chicken burgers, or chicken breast and salad dinner. They think there breaking all the rules when they slather white sourdough bread with butter or brie.... far from the truth. I do not disagree with you that the message to shun saturated fats and replace them with 0mega six high polyunsaturated fats is a vastly under appreciated long-term health disaster. I do not think it is as simple though as saying eat saturated fats and everything will be okay. As suggested in the previous post the heavy processing of saturated fats removes virtually all of the minerals and vitamins, hydrogenates some of the little omega-3 they contain, and at a low level oxidises some of the fats. Grain fed animals have poorer Omega 3:6 ratios. Through our farming practices we are depleting all soils of minerals which feeds through the entire food chain. We need to go back to the nutrient density of the food of our ancestors. A wide range of populations have been healthy on a wide range of diets. Some populations were reliant on for example fish, coconut and carbohydrates, and had very low land animal fat intake. Others managed as inland hunter gatherers. Equally it is wrong to suggest that Omega six fish oils are a panacea, but there is no question that improving the Omega three six profile and intake of EPA and DHA is for most a health advantage. There are a host of dietary factors in the West including alcohol that increase our need for DHA. It is becoming fairly widely accepted that half a gram a day of each of EPA and DHA is beneficial for health. But overall I totally agree with you that we the public need to better understand our food and nutrient needs, and the dietary advice that is driven by subtle commercial forces rather than true health need is a dangerous path. I am saying to eat natural saturated fats, butter, ghee, beef tallow, steak or whatever hasn't been highly processed or hydrogenated. Cut out alot of inferior sources of omega 6's like nuts, vegetable oils hydrogenated or not, and your omega profile should fall back into place. People keep eating a high omega six diet and are taking big doses of fish oil to balance it out... its a disaster waiting to happen.... they just need to reduce there omega six intake which would naturally gravitate them to more of a saturated fat based diet.... that is if they weren't vegan or scared of coconut oil. As far as alcohol consumption and omega 3's. Saturated fat is far more protective to the liver than omega 3 fish oils are. If you have excessive alcohol intake, you have issues to work out with your diet and life. I would never combine a drinking lifestyle with more fish oil intake... thats a liver bomb waiting to go off. Barry groves has a pretty good article on his site about the omega 3 to 6 debate. is that if you get your body running smoothly on fat, you have a minimal requirement for vitamins and possibly (?) minerals. I came to this understanding from reading Hyperlipid and particularly the remark that it is the same as running your body in 'starvation' mode, i.e. how it would run itself when it is using its own stored energy sources. Sensibly, evolution has arranged this so that in this mode, the body can run with no external inputs. Certainly, it is known that increased carbohydrate intake and metabolism increases the requirement for B vitamins (this is why alcoholics often exhibit vitamin B1 deficiency for example) and depletes vitamin C; increased PUFA intake needs vitamin E to stabilise it etc. Back to the saturated fat. I wrote to the company that makes the lard I buy ('FreshFields' Lard in the UK) and I was assured by Kerry Foods Ireland (which owns the company) that they do not hydrogenate it, it is only rendered - which is a traditional process applied to fat to make it usable in cooking. I could have guessed this from the fact that they add anti-oxidants (tocopherols i.e. vit E) to it. The beef dripping I buy is well, beef dripping, it's 57% saturated and 35% mono according to FitDay - and I don't even keep olive oil in the fridge - so no company in full control of its finances would bother wasting the money to hydrogenate it. If I were to render down the excess fat cut from beef and/or purify the dripping off a roast, I would get a product that looked pretty much identical to what I buy in the shops. And if I wanted to use the dripping for deep frying say, it makes sense to purify it in this way - to purify fat you boil it up (very carefully) with some water and then pour it off through a muslin filter - the water takes off impurities (scraps of meat etc.) which would burn when using the fat for deep-frying. i think we should all combine Saturated Fat and Starch together as much as possible.... Mashed potatoes with butter and cream, double bacon cheeseburgers, sourdough bread with butter or brie piled high, steak and potatoes, tortillas made with coconut oil, lard or butter, french fries fried in beef tallow, real cheesecake,... watch the fat melt away, and health return. Interesting about the goitrogenic effect of millet. Add it to the list of plant foods that become more toxic when they're fermented! Cabbage becomes more goitrogenic as you've written (if I recall), the genistein content of soy increases as well. Fermented soy is a good way to get in touch with your feminine side. It doesn't prevent those foods from being healthy in small amounts, but I suppose it shows fermentation isn't a panacea. If I were to eat wheat, I'd eat long-fermented sourdough made with freshly ground whole wheat. But I'd prefer to avoid it altogether. I think rice is a superior grain. Lately I've been making dosas, crepes made from a long-fermented batter of rice and lentils. I make it from brown rice and it's tasty! It strikes me as a good way to eat grains, because it's a complete protein, has very little phytic acid, and contains all the vitamins and minerals of the whole grain. Whole grain rice is actually quite nutritious if you get rid of the phytate. I've been combining brown rice and lentils too. However, I think wheat has a lot of nutrients that rice does not have. It's a particularly good source of betaine (trimethylglycine), which is only found in high amounts in a couple other foods (spinach and beets if I remember right). Freshly ground, non-fermented wheat was part of Price's tooth decay reversal program. Perhaps his patients would have been better off without it, though he seemed to think it was an important part. For the most part, I just like bread. I do freshly grind my flour. I've been using spelt. Thanks for the comments. It is always good to have to recheck ones position. Here is a link for unrendered suet, and one for lard which makes my point. I too had assumed based on the work of others and searches on lard dripping etc that hard fat was almost devoid of nutrients but was having difficulty in reconciling that with the existence of fat soluble vitamins and minerals (-:. Minerals are essential to health for a host of reasons. Re the ingredients of your lard, no mention of Omega 3 and 6 there should be some. Also you could ask them what the oxidised cholesterol levels are. They should be pretty low but it would be interesting to see their response. Deep fat frying is problematic, as it results in oxidised fats and oxidised cholesterol (where animal fats or products are involved.) Oxidised cholesterol and oxidised fats increase oxidative stress in the body, increase the risk of vascular disease, deplete the body of antioxidants the list goes on. If you must fry, saturated fats will be more stable than polyunsaturates, but from all I read deep fat type frying is an avoid. Here is a wikipedia link for lard you may find interesting. Speaking of combining saturated fats with starch, I made delicious beef bone marrow this evening which I slathered all over some toasted sprouted wheat bread. The other night I combined half a stick of butter from grass-fed cows, coconut oil, and some left over bacon fat into a roasting pan and roasted some fingerling potatoes until they were brown and crispy. The whole family was going ape-sh*%t over it, even my 3-year old daughter! I was a proud papa. There's no doubt about it, bread is delicious! I acknowledge that Price had success treating tooth decay using freshly ground whole wheat (along with otherwise very nutritious meals- an uncontrolled experiment as you noted). I don't dispute that wheat can be a good source of nutrients. I just think it seems to have some long-term metabolic effects that don't agree with many if not most people. It's hard for me to believe that sugar alone, or even the partial displacement of nutritious foods by refined foods, could account for the massive decline Price and others have noted in cultures switching to a partially modernized diet. For example, the Inuit he observed were still eating plenty of wild animal foods on top of the flour and sugar, yet their health was destroyed by the new foods. You don't see the same changes in cultures introduced to white rice (for example, in Micronesia they did fine on white rice from the Japanese until the Americans arrived with flour, now they have diabetes and obesity rates among the highest in the world). I recognize that it's hard to tease apart the effects of sugar and white flour because they came hand-in-hand, but wheat being problematic just seems to fit the totality of the data better than any other hypotheses I have at this point. I'm open to other explanations that make sense though. I thought that fermenting soy (as in traditional soy sauce) made it healthier for you, removing the phytoestrogens. Do you think it makes it worse for you? I mainly use it with sushi, rare because of the rice, but from what you say I may be a little easier on myself about that. Also as a marinade. I've been told before that rice contains a compound that suppresses the production of human growth hormone (other than the glucose, I assume). Has anyone else ever heard of such a thing, or is this a health myth? Stephan, I love your blog. I think that I glean a lot of information that makes sense to me. I love dosa by the way. It's possible the wheat protein was a major culprit, but most of the groups were not eating many wild foods, and in fact I remember him saying the modernized Eskimo regarded it as a mark of dishonor to hunt their own food instead of eating canned meats. They didn't have dentists to fix their meats or public policymakers to fortify their flours. Ultimately, while Price's interventions were multi-factorial, they were still interventions and thus are stronger evidence than observations, and they show that tooth decay and many other conditions can be reversed by supplying nutrient-dense foods without removing wheat protein, at least in the population he was studying. Joseph, fermenting soy neutralizes some of the anti-nutrients such as phytate, but it does not destroy phytoestrogens. On the contrary, it makes the phytoestrogens more bioavailable. The phytoestrogens are the goitrogens, so fermenting soy makes it more goitrogenic. As with any goitrogenic food, the key principal is moderation. The effect of soy (but not millet) is probably overcome by a little extra iodine, just like the effect of sauerkraut. I agree with what Chris said. It's probably fine in moderation, and in fact fermented soy has other advantages like a high enzyme content that aids digestion. I haven't heard that, and I couldn't find anything about it in a quick internet search. I have a few more points to add to the pot. One is that starchy tubers are not much more nutritious than white flour. If you look up potatoes, taro or cassava, they're on the same nutritional level per calorie as unenriched white flour and white rice in their vitamin, mineral and phytate contents. Maybe slightly more nutritious, but not much. So I think it's significant that even Polynesian and Melanesian cultures switching from a heavy reliance on tubers to white flour and sugar (of course sugar is less nutritious than tubers) degenerated severely. In fact, their health declined perhaps more than any other group. On some of these islands, 35% of people are diabetic and virtually everyone is obese. One mitigating factor is that the vitamin C content of the tubers may have effectively overcome the small amount of phytate present in them. One of the other things that makes me wonder is some of the intervention trials that are being conducted lately. There are the low-carb trials that have shown success in reversing metabolic dysfunction, so I initially thought, OK excessive carbohydrate is the problem. But now we have these paleolithic diet trials that show spectacular improvement of metabolic problems, independent of carbohydrate restriction (even in healthy people not losing weight). And the latest one was even high in sugar, but despite that, everyone who was insulin resistant normalized their insulin sensitivity in a short time. These diets are also not low in PUFA because they use canola oil and mayo a la Loren Cordain. Not the kind of diet I would recommend long term but it certainly brought about some remarkable improvements in the short term. So there's something that changes in these diets that brings about rapid metabolic improvements. Wheat is a major food that is marginalized in LC diets and eliminated in paleo diets. Add that to the fact that around 12% of the population has anti-gliadin antibodies in their blood and 30% have it in their stool (if you believe Dr. Ken Fine's unpublished results). One explanation I've considered is that wheat increases the need for fat-soluble vitamins. I have a study showing that wheat bran supplementation increases the rate at which healthy people burn through their vitamin D stores by roughly 30%. Celiacs are often D deficient, despite the fact that most of your D never passes though the gut. Gluten-free diet normalizes D in these people. Again nothing conclusive, but there seems to be a lot of circumstantial evidence pointing in the same direction. What I was alluding to in that last paragraph is that if wheat exerts negative effects by increasing the need for fat-soluble vitamins, that theory would be compatible with Price's program for reversing tooth decay-- he was feeding them such high levels of fat-soluble vitamins and minerals that it didn't matter if their needs were increased by wheat. This is wild speculation by the way. I'm just trying to make sense of all this data. In a 1928 paper by Edwarn Mellanby and a colleague, he states quite matter of factly that one of the most well-demonstrated things about fat-soluble vitamins at the time (A and D, at that point) was that cereal grains cause a massive increase in the need for them, and he cited a literature review he had done on the topic. I'll have to look that up and see what there is to it! No kidding! I would very much appreciate that reference if you can find it. Thanks! I agree with Ed re: sat fat causes hyperglycemia. I would go a step further and say that a function of sat fat is to prevent hypoglycemia, it has a "sugar stabilizing" effect, although hyperglycemia/hyperinsulinemia are going to be outcomes if sat fat intake is too high. I also agree that monofat improves insulin sensitivity and promotes glucose disposal and lower insulin levels. My experiences reflect this. I am experimenting with a higher mono diet, eating avocados and olive oil frequently. I feel much more full and satisfied, my energy is more stable. When I attempted a high coconut diet, I had symptoms which were exactly like what I get when I overdo carbs. When I eat too much sausage and cheese and calories of fat, I also get carb symptoms (very high sat fat foods). Symptoms are lethargy, acne, hunger but feeling full, weight gain, emotional difficulty, basically feeling like crap. I have come to the conclusion the only free food (free in the sense that it has almost ability to cause metabolic problems) is monounsaturated fats. Polyunsaturated omega 3 is also a free food if one had previously been consuming a high amount of omega 6 (and if you were eating a normal diet, that includes you). But the only truly neutral food is mono fat, because it has very little adverse effect on insulin sensitivity but it has all the benefits of fat as in it contributes next to no glycemic load or direct insulin response (indirectly all fat increases glycemic/insulin burden because of adverse effects on glucose tolerance when fat/energy is high, but directly all fat has very little glucose or insulin contribution). Pooti - are you restricting calories? A lot of the times, the poison is in the dose. A meal of sausage, cheese, and eggs can either render me hyperglycemic and promote weight gain or it can make me feel balanced energetic and promote weight loss. The sort of sugar/insulin response I get from a meal all depends if I am over feeding myself. If the diet contains a lot of trouble foods - high saturated fats, carbohydrates greater than 50s/60s, high proteins - do not be surprised if you fail to lose weight because this diet may promote a glycemic burden. Perhaps the burden is insufficient to trigger your diabetes, but significant enough to prevent body fat from being reduced. It takes a relatively minor change in diet to control typical non-advanced early type 2 diabetes, but a major change to actually induct substantial weight loss. If you want to know why you should trust me, I have lost 160 pounds and maintained a low carbohydrate way of eating for over 6 years. I am 5'5 and now weigh 120s. Well, an older woman with diabetes shouldn't really expect to lose weight on 2000 calories per day. If you are not gaining that is a sign your metabolism is pretty good. Try knocking calories back to 1500, I mean really COUNT them don't just eye ball it (e.g. weigh your meat, measure out your fat, keep a food journal). If you do not lose weight, you certainly have a medical condition... but I am pretty sure you would lose weight. As for gaining 4 lbs a month eating 1400-1800 cals of 30-50 carbs/day... I wonder if a lot of that weight gain is your body recovering from the trauma of out of control diabetes and nutritional deficiency of previous diet? Building bones and muscle and such and not necessarily fat... because one should definitely not gain fat on 40 carbs per day and 1600 calories avg. Again, this bares repeating: counting is essential. 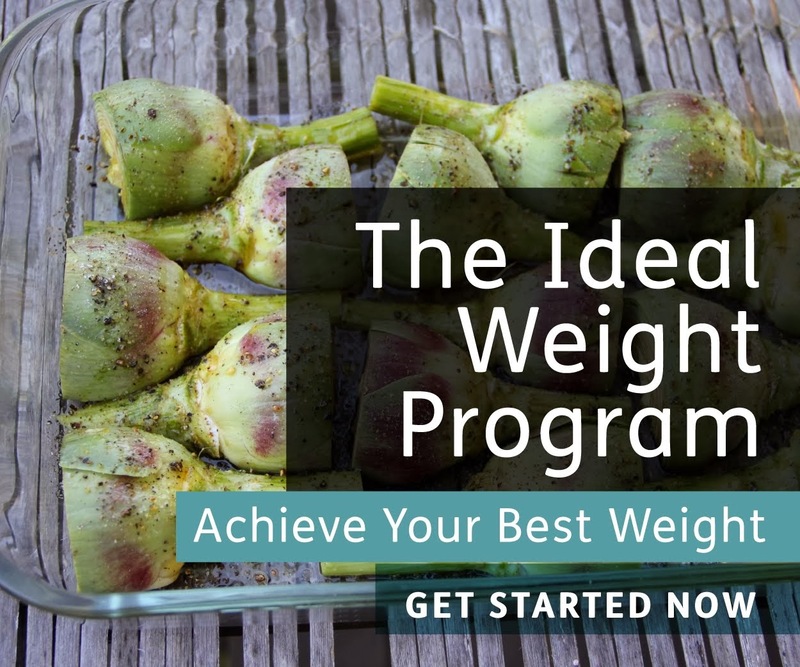 The difference between success and failure for me and almost everyone else who loses weight is having a detailed knowledge of how much and what you are eating during weight loss. It may not be necessary to be so strict after weight loss, but during the acute phase, especially if weight loss is not happening, you need to buckle down and weigh / measure everything, and keep journals. GI partly works for me: I have low to no Phase 1 insulin and can still generate quite a lot of Phase 2 but it's rate limited, so if I have to eat carbs, low GI stuff suitably diluted with fat and fibre will slip into the bloodstream without causing BG spikes. Something like a small piece of pizza with a load of salad washed down with red wine will cause a minor BG rise over a few hours. which probably explains why even wheat bran will cause a BG spike. Other nondiabetic family members have a similar response to wheat (one can eat rice cakes which I also can't handle, but I can do small quantities of oatcakes, not porridge though) as do some people I'm not related to, including a Type 1 who claimed a non-stoichometric relationship between wheat and his insulin. OTOH I know one or two diabetics who can eat things like visible quantities of banana or significant amounts of parnsip which will cause BG spikes in others: this ties in with what Chris Masterjohn says about individual variation. Another factor is diurnal variation in insulin resistance: I can eat two or three times the carb load in the evening than at breakfast and for many the slope is even more extreme. Just discovered your site. Very interesting work you are doing! My comment is late in the game here, but this article seemed to be the most "on topic" for my question. Could you comment on "resistant starch"? I'm wondering to what extent your "modest spike" after eating a potato and some bread might be related to the potato being a source of resistant starch. It seems to me the issue of resistant starch weakens the reliability or usefulness of the GI (supporting the main point of the article). But you didn't bring up this issue. So, I am wondering if you think it is either an invalid or not particularly useful theory. That resistant starch article looks like an advertorial. Anecdotally, manufactured resistant starch like Dreamfields pasta appears to have widely differing effects on diabetics who test their postprandial blood glucose. For some (me included) it produces a slight BG rise for a while and no more, just like it says on the tin. For others it causes exactly the same BG rise as ordinary pasta. For yet others it causes a low BG rise over a substantial time period, and for still others it causes no immmediate change, followed by a BG spike maybe as long as four hours after it was ingested. Anecdotally again I've seen similar widely differing responses to eg. inulin, which suggests digestive and other factors in its metabolism differ significantly between individuals. "In a 1928 paper by Edward Mellanby and a colleague, he states quite matter of factly that one of the most well-demonstrated things about fat-soluble vitamins at the time (A and D, at that point) was that cereal grains cause a massive increase in the need for them, and he cited a literature review he had done on the topic. " Hmmm, this may be a secondary factor: cereal grains cause a massive increase in dieticians . . . I agree that there are problems with the wiki entry, and have just added my two cents to the discussion on that page concerning neutrality. It doesn't seem right to me that the first external link, for example, is a company that manufactures resistant starch products. I'd be happy to be directed to better info sources and studies. But it still seems to me that there might be something to this. At the least it seems worthwhile to bring up the issue when discussing the GI as a metric. it's easier to count total carb than the GI for diabetic. otherwise, one may just look @ a sneaker bar's GI & decides it's healthier than potato(or whatever tuber)!